Wipe your drool-ridden mouth. Now for the main course. 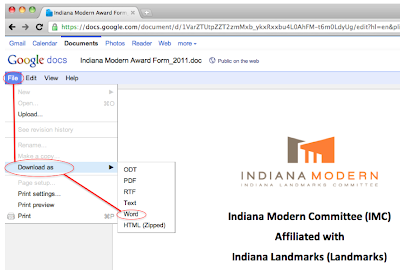 For the first time ever, Indiana Landmarks is recognizing the Mods with two awards categories. [insert happy dance]. More categories may be added in the future. If you have suggestions, share them. It'll be made of wood and brushed aluminum. And it'll be rare. And cool. And show-off-able. Now get to entering (or nominating) an Indiana Mid Century Modern gem. 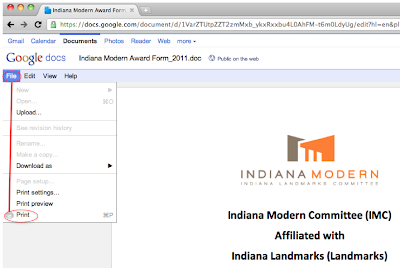 Not just Indianapolis - these awards are state-wide. You can view (or download) the form here. Read the rules. Then complete the form. 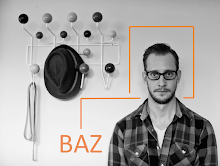 You can snail mail it or submit it electronically. Your call. Entries are due on April 29th, 2011. 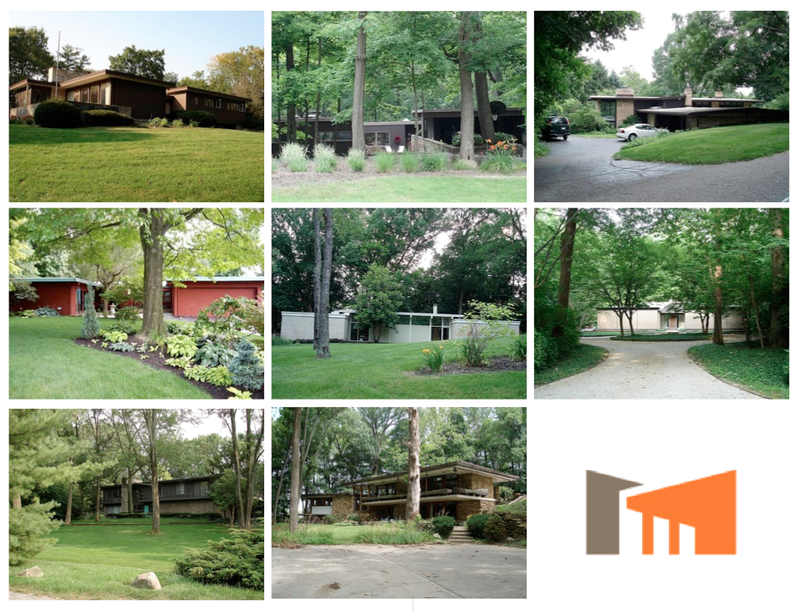 Winners will be chosen and announced during the 2011 Indiana Modern Home Tour weekend in May, which includes a Miller House symposium. [insert another happy dance]. We'd love to see entries from all across the state. Please spread the word to anyone you know whose abode is award-worthy. The first home in the second row looks interesting. Found the below on the Indianapolis Art Museum site, thinking it very apropo to your posting, and other readers might enjoy. Commissioned by industrialist and philanthropist J. Irwin Miller and his wife Xenia Simons Miller in 1953, Miller House expands upon an architectural tradition developed by Ludwig Mies van der Rohe—epitomizing the international Modernist aesthetic—with an open and flowing layout, flat roof and stone and glass walls. The rooms, configured beneath a grid pattern of skylights supported by cruciform steel columns, are filled with textiles that feature strong colors and playful patterns. Amid the residence’s large geometric gardens, its grandest feature is an allée of honey locust trees that runs along the west side of the house. In 2000, the Miller House became the first National Historic Landmark to receive its designation while one of its designers, Dan Kiley, was still living and while still occupied by its original owners. The house showcases the work of leading 20th-century architects and designers: Eero Saarinen, Alexander Girard and Dan Kiley. Learn more at the Miller House Symposium, Friday, May 20. Today, the property offers visitors the opportunity to experience one of the finest expressions of American modernism, an integration of house and landscape that draws upon historical precedents without repeating them, enfolding them in a compelling composition of forms and spaces that captures the genius of its designers, the aspirations of its owners, and the spirit of their time. Miller House and Garden is owned and cared for by the Indianapolis Museum of Art. Tours at Miller House and Garden are made possible through the Columbus Area Visitors Center. Learn more on how to reserve a tour." I guess there is nothing "delicate" about our renovation, but you need to come by for a bevvie and see all the cool new stuff! The award is so brasila!